Several posts ago, the one on twirling, I mentioned I had attended an IF:LOCAL gathering. Then I briefly told you of a long-time desire to gather women around my table. I told you I intended to stop talking and instead “trust God and move.” I also said if you did not see a post on this gathering by the end of March it meant I needed encouragement in the bravery department. I gave deep thought to what to call this gathering of women (a catchy name is a must), and who to invite. A part of me loved the idea of posting an open invitation on Facebook to local friends. Typical to my nature, I questioned the idea. Various discussion ideas played out in my head. Mainly, I knew I had to trust God with the details by letting go of control and any expectations I had for this gathering. Truth be told, I lost bravery quickly and did nothing. Then a dear friend who had joined me at the IF:LOCAL sent me a text to tell me of the step of faith she had taken. 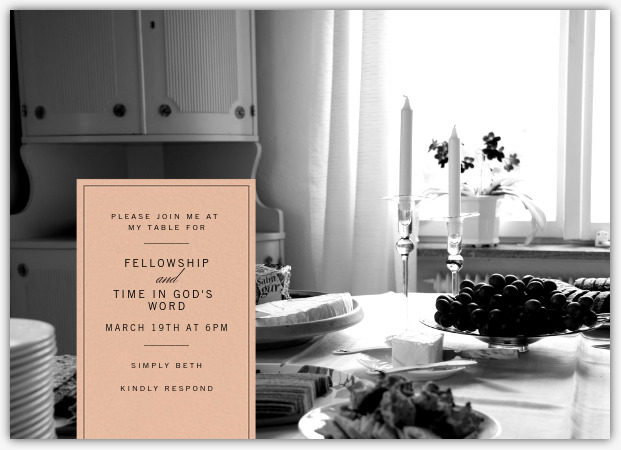 In her text she included a copy of the invitation she would soon send to those invited to gather at her table. My next reaction (because let us not park long on jealousy. ): Be brave, Beth. If God has placed this desire on your heart He also asks you to step out in faith. So I got brave and designed an invitation with the help of Paperless Post. The catchy name was going to be "A Table of Hope Builders"
Then I lost bravery again when it came time to add the names of those on my heart to invite. The enemy gained a foothold on my thoughts. What makes you think anyone wants to gather around your table? No one will show up. Don't press that send button, Beth. I had not fully given up on the idea. I have been in God's Word long enough to know lies versus truth. And I so want to be finished with believing lies. It sure felt like God was closing the door on this gathering though. 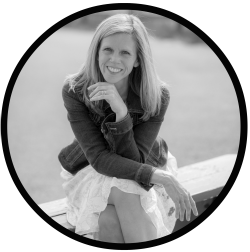 A whirlwind of changes began when my husband returned to the states much sooner than planned due to medical issues. Rightfully so, all other plans came to a halt. The gathering of women around my table would need to wait, or maybe my heart's desire (my prayer) was to go unanswered. This past Saturday, the Saturday I had intended to gather women around my table, without an official invite extended, two ladies at two different times joined me at my table. As I hugged and said good-bye to the second lady I had a moment of sudden realization. God had answered my prayer. Maybe He did not answer with what we might call a much bigger answer, but the right answer. Because God’s ways are always right; they are abundantly above all that can we ask or think (Ephesians 3:20). God answered another prayer too. Since the day my husband departed for his second deployment I had asked God to make our time apart go quickly. Please God, make this time of separation not feel like forever for there are days when it feels like forever until I will see him again. He replaced my small request with a much bigger answer. I may not fully understand why He answered this way but as I have said previously, the why does not matter. And God did not cause my husband's injury to bring him home sooner; He allowed and used a circumstance to accomplish what He had always intended… an earlier reunion for two people who obediently said yes to His calling (another deployment) but also longed to be together again. As I navigate a season of change and uncertainty, God reminded me of a truth I desperately need to cling to: God can be trusted to love perfectly. “God's way is perfect. All the LORD's promises prove true” (Psalm 18:30). So in the midst of this somewhat difficult season, I will praise Him. For when we belong to Him we will always find Him to be Faithful and True (BSF notes). He alone gives us joy today and forever. God did indeed answer your prayer, and brought two women to your table who He ordained to be there in those moments. Going through seasons of uncertainty can be challenging in our faith, but God has ways of showing us that He's still in control and that His love is perfect. Continuing to pray for your husband. I am so glad he's home! Hugs to you my friend. You know, God has a way of acting unexpectedly. And sometimes, if we're not on the lookout and listening to the Spirit, we just might miss the way that He's answered a prayer. Love that you saw His hand, and the way that He brought to your table exactly who He wanted there. And too, even when life hands us the unexpected stuff, God still weaves His purposes into the circumstances. God is good, and I praise Him for moving in your life, and for showing you once again (like He does for all of us) just how faith-full He is! He answers in the most extraordinary ways, doesn't He, Beth ... thanks for this lovely peek into your life. I'm hoping that your husband is improving with each passing day. Meanwhile, we hang on to this glorious truth ... Christ is risen indeed! Amazing how when we let go, God is truly able to work. BEautiful the lesson He revealed to you in HIS timing. He answers our prayers in ways we never imagined, but always with love. You are in my thoughts and prayers! 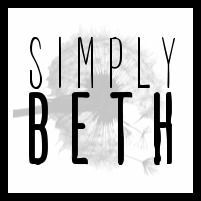 I think this is one of my favorites posts of yours, Beth. You have the gift of viewing life with an eternal perspective. You bless and encourage us each time you share from your heart. Blessings on your Easter, my friend! Hi Beth! I know you are currently out of town, but I had to comment here. Isn't it just like the Lord to plan things we have no clue about? His plans for us are so high, so deep, we can't usually put our fingers on them. "For my thoughts are not your thoughts, my ways are not your ways..."
And that means we question and wonder and collapse under the weight of the unknown. I love how you ended this post, because you are not collapsing at all. You know God is in your soul, and you are ready to ride down the road with Him. Whether you call to your table, or the Lord summons, it will all be well. His ways are past finding out. Beautiful lessons woven throughout this post.